With an estimated 1.7X expansion in terms of sales revenue over 2017-2027, the global tissue paper converting machines market is expected to approach US$ 2 Bn towards the end of 2027. Brisk adoption of technological innovations and escalating investments by global brands in modern machinery will prominently contribute to the growth of tissue paper converting machines market that has been projected at a 5% CAGR during 2017-2027. An analysis of the competitive scenario of the tissue paper converting machines market reveals that Tier 1 companies account for more than half of the total value of tissue paper converting machines market, whereas the rest is covered by smaller players competing in the tissue paper converting machines landscape. The Tier 1 players have been the most prominent adopters of automated high-capacity machinery, and on the other side, the Tier 2 and Tier 3 companies in tissue paper converting machines market represent a strong toehold overseas as well as in local markets owing to expertise in customized, low-capacity projects. The industrial sector is witnessing a paradigm shift to high automation levels, and leaders in tissue paper converting machines manufacturers are rapidly adapting to the ‘Industry 4.0’ trend for improved operational efficiency. Increasing incorporation of cloud and cognitive computing, IoT, cyber-physical systems, and other data exchange technologies is helping Tier 1 tissue paper converting machines market players achieve enhanced efficiency, higher throughput, top quality, and minimal manual error. Moreover, machinery equipped with Industry 4.0 features assures regular maintenance and wellbeing of the entire manufacturing system and exchanges real-time data across the value chain of tissue paper converting machines market. 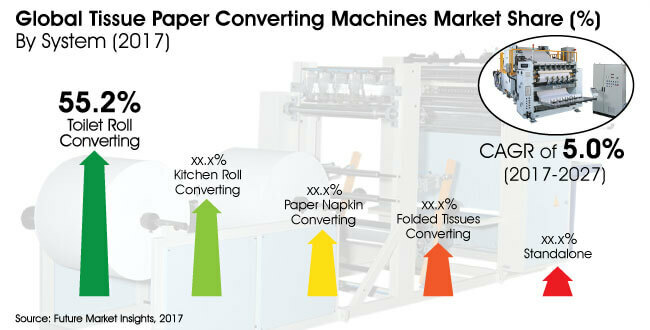 Although high price point will remain a longstanding barrier for widespread adoption of automation in tissue paper converting machines market, it is most likely that the growing automation and data analytics trend will significantly contribute to the growth of tissue paper converting machines market. With modernizing lifestyle, a considerable consumer base is shifting from standard to premium quality tissue paper products, especially toilet paper rolls and kitchen rolls. The consistent quest for high-end quality will continue to boost upgrade and expansion of lines of tissue paper converting machines. A recent research on tissue paper converting machines market indicates visibly improving prospects for multipurpose and jumbo kitchen rolls as a result of product premiumization. The AFH (away-from-home) market is also anticipated to raise significant demand for premium quality products in tissue paper converting machines market. China specializes in low-cost tissue paper converting machines manufacturing and is likely to remain the leader in jumbo tissue paper rolls production globally. With the highest per capita consumption of tissue paper products, China is projected to secure the top market position in tissue paper converting machines landscape through 2027. Europe, one of the most prominent tissue paper products exporters globally, will remain a key market for tissue paper converting machines market throughout the forecast period. High-capacity tissue paper converting firms are expected to uplift the growth outlook for European market for tissue paper converting machines. The global tissue paper converting machines market is expected to remain a fragmented landscape, with top 10 companies holding half of the market value share. Thorough analysis of the competition scenario of tissue paper converting machines market uncovers dominance of Italian manufacturers in the global tissue paper converting machines market. A majority of Italian companies including PCMC Italia SpA, Omet SRL, United converting SRL, and Futura SpA are focusing on the expansion of the manufacturing capacity of tissue paper converting machines. It is most likely that the competitive scenario in tissue paper converting machines market will witness a number of developments in brand development realm. Growing premiumization in tissue paper converting machines market is anticipated to fuel investments in new machinery procurement targeting improved designs and aesthetics of tissue paper products. Smaller players in tissue paper converting machines market are extending investments in high-end European machines for premium quality tissue paper products. Constant product innovation and superior end user experience will remain the key for companies to achieve increased market shares in the tissue paper converting machines space. Click to know more on competitive scenario and understand key strategies of market participants in the tissue paper converting machines market. Our analysts have provided a detailed forecast and analysis of the tissue paper converting machines market at both the global and regional levels. Through extensive research, our analysts have studied how the different market dynamics are likely to impact the current and future scenario of the global tissue paper converting machines market, thereby providing useful insights to market players to plan their differentiating strategies capable of evolving with the changing market landscape. We have analysed the key trends, drivers, restraints and opportunities while studying this market. Impact analysis of key growth drivers and restraints based on the weighted average model is included in the report to better equip and arm clients with crystal-clear decision-making insights. This report provides historical data of 2012-2016 along with forecast from 2017 to 2027 in terms of revenue (US$ Thousands) and volume (Thousand units). The report also includes macroeconomic indicators along with an outlook on packaging consumption across the globe. The report further comprises the study of current issues with end users and opportunities for tissue paper converting machines manufacturers. It also includes a detailed pricing analysis by tissue paper converting machines and a value chain analysis. The report indicates the segment wise definition of the market along with its overall scenario in the assessment period. The publication focusses on identifying opportunities in the global market and present updates and insights pertaining to the various segments of the global tissue paper converting machines market. Weighted average prices in US$/units have been considered for tissue paper converting machines to arrive at the market size. Key market splits have been deduced from extensive surveys and primary research. The prices of tissue paper converting machines have been tracked at the wholesale level after conversion through trade websites and primary interviews. In order to provide a comprehensive view of the market, we have included a detailed competitiveness analysis and information on company players with unique selling propositions. The dashboard provides a detailed comparison of manufacturers on parameters such as operating margins, unique selling propositions, collective market share, and geographic concentration. The study encompasses market attractiveness analysis of various segments of the global tissue paper converting machines market. The report includes the consumption of tissue paper converting machines and the revenue generated from the sales of tissue paper converting machines in all regions and important countries within these regions. Growth in per capita food consumption, GDP growth, retail industry growth, and top 10 companies’ growth has been closely tracked to arrive at the market forecast. Apart from value chain analysis, profitability margins, cost influencing factors, pricing trends and factors influencing the sales of tissue paper converting machines have also been included in the report. A number of primary and secondary sources have been consulted during the course of this study. Secondary sources include Factiva, World Bank, Packaging Digest, and Hoover’s. Companies’ annual reports and publications have also been examined while researching this market. The important market numbers have been estimated based on average consumption and weighted average pricing of tissue paper converting machines by system type and the revenue is derived through regional pricing trends. Market size and forecast for each segment has been provided in the context of global and regional markets. The tissue paper converting machines market growth has been analysed based on expected demand in the global market. Prices considered for the calculation of revenue are average regional prices obtained through primary quotes from numerous regional tissue paper converting machines manufacturers, suppliers, and distributors. All key end users have been considered and potential applications have been estimated on the basis of secondary sources and feedback from primary respondents. Regional demand patterns have been considered while estimating the market size for various end users of tissue paper converting machines across different regions. 15.4.2. Paper Converting Machine Company Italia S.p.A.
15.4.4. Kawanoe Zoki Co., Ltd.
15.4.6. BaoSuo Paper Machinery Manufacture Co., Ltd.
15.4.10. Dechangyu Paper Machinery Manufacture Co., Ltd.
15.4.12. C.G. Bretting Manufacturing Co. Inc.
15.4.14. Zambak Kagit San.Ve Tic.Ltd.Sti. 15.4.17. 9. Septembar- Tissue Converting D.O.O.